The National Aquarium’s Animal Care and Rescue Center in Baltimore, Maryland, is treating two sick harp seals. The harp seal (Pagophilus groenlandicus) is a species of earless seal native to the northernmost Atlantic and Arctic oceans. It is also called saddleback seal because of its dark, saddlelike marking on the back and sides of its light yellow or gray bodies of the adults. Young seals are known for their snowy white coats. They are universally beloved for being adorable. Each year, the center names its rescued animals based on a theme, and this year’s theme is scientists. 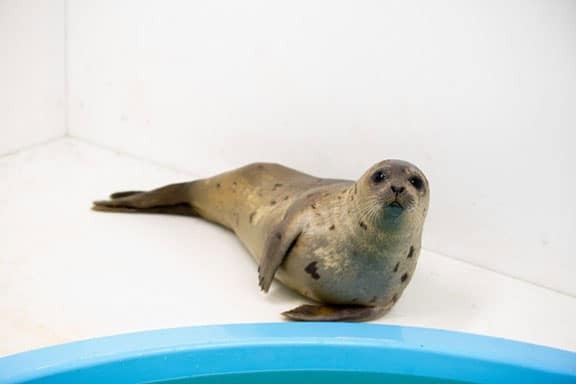 One of the female harp seals, which was rescued in January in the Ocean City, Maryland, area is named Marie Tharp, after a cartographer who made maps of the ocean floor. The other female harp seal, rescued in February in Delaware, is named for astronaut Sally Ride. Marie’s main issue was severe dehydration. She also had seal lice, intestinal worms and a mild respiratory infection. When Sally was brought in, she was also suffering from dehydration. She also had a severe case of seal lice. The seals were in pretty critical condition when they were first brought to the center, says Weaver. Eventually, the staff wants to house Marie and Sally together so they can learn from each other and have some enrichment. The center also hopes to potentially release the seals around the same time, but no release date has been set yet. “We hope they might return to their natural habitat within the next month,” says Weaver. As an extension of the National Aquarium’s mission, the Animal Care and Rescue Center provides a permanent and world-class home for the care of the Aquarium’s current and future animals and some of its animal rescue operations, says Weaver. Home to up to 1,500 animals at any given time, the center’s ample pools provide a place for care and acclimation for species from beta fish to sharks, and more than doubles the capacity for off-exhibit and rescue animal care. The 56,339-square-foot building also houses the exhibit fabrication workshop and classroom and community space. “The Animal Care and Rescue Center is specifically home to our state-of-the-art seal rehabilitation suites,” says Weaver. Read: Are Exotics a Fit For Me?